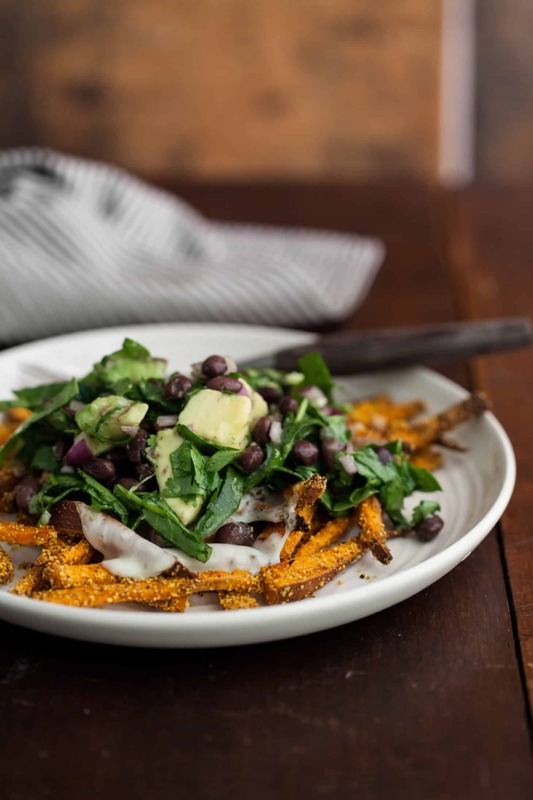 Southwest Loaded Sweet Potato Fries | Naturally. 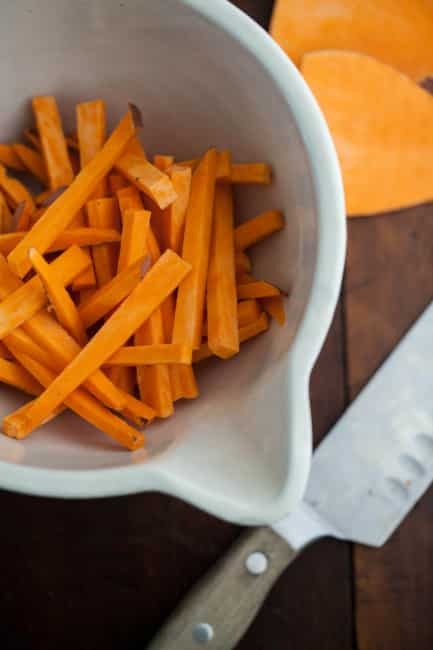 Preheat oven to 400˚ Wash the sweet potato well and slice into 1/4″ slices and then each slice into fries. * Rinse the sweet potatoes under cold water and place on a tea towel, pat dry. 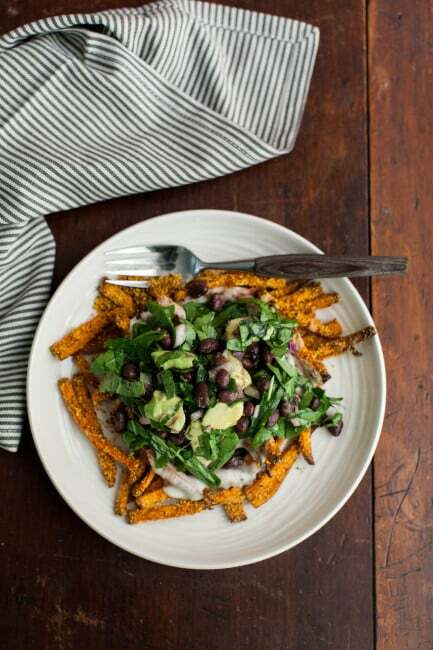 In a bowl, toss the sweet potatoes with the coconut oil. Sprinkle in the cornmeal and adobo seasoning, continuing to toss until fries are well coated. Spread fries into a single layer on a lined baking tray. Bake for 35-40 minutes until fries are browning and crisp. Remove and gather into a pile in the center of the pan. Add cheese on top of fries and return to the oven, baking for another 4-6 minutes until the cheese is melted. Transfer fries to a plate. While fries are baking, make the topping. Combine black beans, spinach, avocado, and onion together. In a small bowl, whisk together lime juice, cilantro, honey, and olive oil. Pour over the spinach mixture and toss. Serve fries with the spinach mixture. *While this post is ancient, I still stick by my way of cutting potatoes into fries- works everything time. Combine in a bowl and whisk together. Multiply recipe for larger quantities. I too have had a serious longterm relationship with fries! Unfortunately I haven’t had a whole lot of luck making them at home. 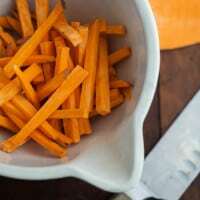 I can make great oven fries, but that’s just not the same… I have a few sweet potatoes chillin’ at home, so I might just have to give this a try over the weekend. Question, though…what is queso quesadilla cheese? Oh man, I love how balanced this dish is! I also love the crunch from the corn meal. I am soooo making that adobo seasoning this weekend! Love the idea of layering a taco salad of sorts on top of the fries! And funnily enough I just made a very similarly-spiced adobo sauce for dinner the other night! 😉 This looks really flavorful, and I think you do a good job of showing that well-balanced, healthy meals can be exciting and full of flavor and textures, because in the end whether we are dieting or not it should never be about feeling deprived! I’ve had a major sweet potato fry craving in the last couple of weeks and I still haven’t done anything about it. This has inspired me to change that asap. I’m always on the look out for the next less guilty version of the traditional fry to fall in love with. Can’t wait to give these a try! You have outdone yourself here Erin. This recipe is fabulous and right up my alley! 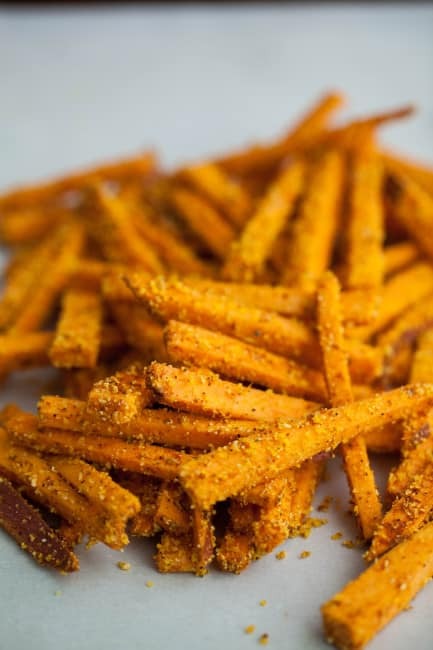 You totally just made me dream of sweet potato fries. I want to pick one of those babies up and pop it in my mouth! I can pretty easily say no to regular fries…but sweet potato fries? It’s a yes. EVERY. TIME. Lovely recipe! It made my mouth watering as soon as I saw it and I tried it today with a few changes here and there! I blogged abouit here http://tieanddiy.blogspot.fr/2014/03/frites-de-legumes-racine-et-salade-la.html. I used parsnip instead of sweet potatoes and omitted the queso quesadilla cheese, and added feta in the salad. Of course, I credited you and your blog in my article! What a great idea, love sweet potato fries and the topping is just perfect! Made this for dinner a couple nights ago and it was delicious! I would have never thought to add the cornmeal, but it was fabulous! I also really liked the queso quesadilla cheese on these fries. So tasty!